Describe the tool or resource that supports each stage of the AppExchange product lifecycle. List the types of Salesforce orgs that partners use in the AppExchange product lifecycle. Get access to your Partner Business Org. Have you ever been asked to build something for your team, only to find out later that someone else—maybe even a team member—built the same thing? That’s called reinventing the wheel, and it can be frustrating. We want you to focus on making your solution awesome, and never on reinventing the wheel. As AppExchange partners take an idea to the marketplace, they perform common tasks. We created tools and resources to help partners accomplish these tasks. In this unit, we introduce you to those tools and resources and tell you where they fit in with the AppExchange product lifecycle. Let’s look at the tools and resources available in each stage of the AppExchange product lifecycle. As a reminder, the AppExchange product lifecycle has six stages: plan, build, distribute, market, sell, and support. Don’t worry if you don’t recall all the specifics. As we introduce tools and resources, we’ll remind you of the tasks you perform in each stage. Learn the Salesforce platform, and create a roadmap for your solution. Develop your solution and then test it to ensure an amazing customer experience. Package your solution, and list it on the AppExchange. Generate market interest in your solution. Convert leads into paying customers. Update your solution, and provide technical support to customers. You get access to these tools and resources for free when we approve your application to the AppExchange Partner Program. Now that we’ve introduced you to the tools and resources you use, let’s look at where most of the action happens. A Salesforce org is the environment you share with users at your workplace. It contains standard Salesforce functionality, your data, and any customizations you’ve created. Depending on where you are in the AppExchange product lifecycle, there are different kinds of orgs that you work with. Put your critical apps and data. If you’re new to the AppExchange Partner Program, we supply you with a special type of production org called a Partner Business Org. 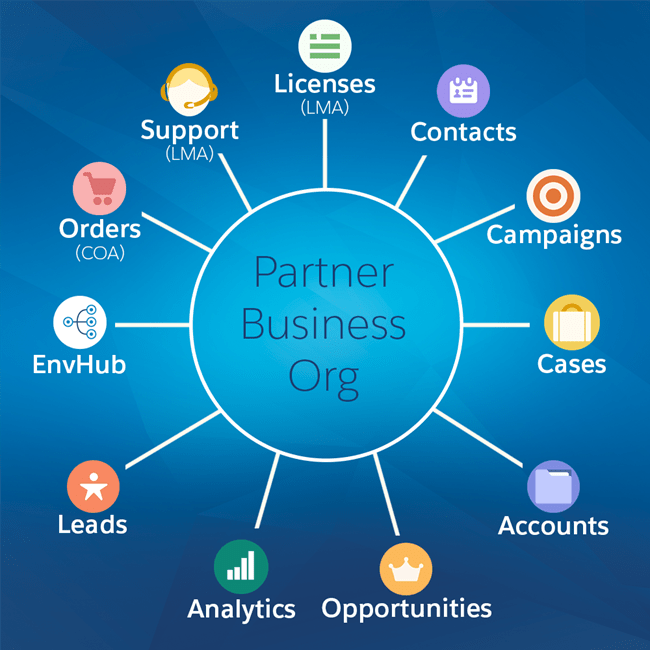 The Partner Business Org has AppExchange partner tools pre-installed, along with two Sales Cloud licenses. Build your solution. A developer org allows you to experiment without putting critical data at risk and is separate from production. As an AppExchange partner, you can create Partner Developer Edition orgs that have more licenses and storage than the standard Developer Edition. If you're using Salesforce DX, you can also use scratch org for development. Package your solution for distribution. We recommend using a Partner Developer Edition org for packaging, but a Developer Edition org works, too. Test your solution. Use a test org to verify that your solution provides an amazing customer experience. You can create test environments based on Group, Professional, and Enterprise Edition orgs. If you're using Salesforce DX, you can also use a scratch org to create multiple ephemeral test environments. Show off your solution to prospective customers. A demo org is based on a standard Salesforce environment, but has more user licenses and storage. These special features let you set up an org just like a customer does, which allows your sales team to deliver powerful demonstrations. You can create demos based on Group, Professional, and Enterprise Edition orgs. Let customers experience your solution firsthand. You can let customers interact with your solution in their own trial Salesforce org or one you’ve set up. Along with your app or Lightning component, you can customize a trial org with users and sample data. Test functionality created by others. A sandbox is a copy of a production org. It provides a realistic environment where customers can test things, like a new AppExchange solution, without putting their company’s critical apps and data at risk. As an AppExchange partner, use a developer org to build your solution, not a sandbox. “Partner Business Org” and “Partner Developer Edition Org” sound similar, so let’s take a moment to make sure that the difference between them is clear. Imagine that you’re the captain of a ship—the AppExchange Partnership. Your customers are the passengers, and your development, sales, and marketing teams are the crew. Instead of all-you-can-eat buffets and awkward dance nights on the Lido deck, people come aboard for exciting new Salesforce functionality. If you have one and not the other, the AppExchange Partnership gets lost at sea, which will probably distract from the shuffleboard tournament that you planned. To keep track of the differences between a Partner Business Org and a Partner Developer Edition Org, refer to this table. How you access your Partner Business Org depends on how you signed up for the AppExchange Partner Program. If you joined the AppExchange Partner Program without an existing Salesforce account, we created a Partner Business Org when you signed up. To access your Partner Business Org, go to login.salesforce.com and sign in using the credentials that we sent when you created the account. That’s it. If you used an existing Salesforce account to join the AppExchange Partner Program, no problem—we can add AppExchange partner tools to your existing Salesforce org. We start with the Environment Hub because it’s the first tool you use. Later on, you get access to the other tools you need. Log in to the Partner Community using the credentials you used to sign up for the AppExchange Partner Program. Go to the Support tab. Choose Environment Hub, and then choose Create a Case. Please enable Environment Hub in this Salesforce org. You’ll receive an email from the Partner Support team after the Environment Hub is enabled in your org. We covered a lot of ground in this module and, from where we’re standing, you didn’t even break a sweat. Nice work! Let’s take a moment to review what you accomplished. You learned how the AppExchange Partner Program can help you take an idea for a solution to market. You learned about resources in the Partner Community to support you on your AppExchange partner journey. You learned about the stages of the AppExchange product lifecycle and the special tools that can make the lifecycle easier for partners to navigate. You signed up for a Partner account and logged in to your Partner Business Org. Impressive, right? Of course, there’s still plenty of trail ahead. In coming modules, we’ll dive into the process of planning and developing an offering, getting it ready to distribute to customers, and more. Until then, happy trailblazing!